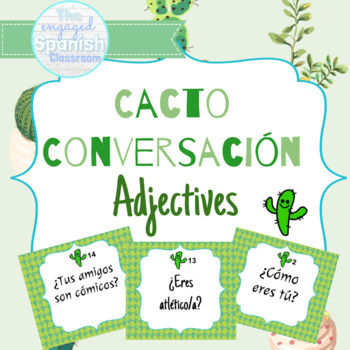 This Spanish speaking activity for "los adjetivos" is perfect for a level 1 Spanish class. It gets all students speaking and participating, either in pairs or small groups. The comprehensible questions are great for all students. Need a way to get your students SPEAKING more, and COMPLETELY in the target language!? Give this activity a try, and you and your students will all be hooked! This activity provides pairs or small groups of students with 24 questions practicing the designated tense/unit. Students are called to pick a card from the pile, and ask their partner (or the person to their left in a small group.) Students must then answer COMPLETELY in the target language! Each student can record their partners' answers on the response sheet if you'd like to practice writing as well. 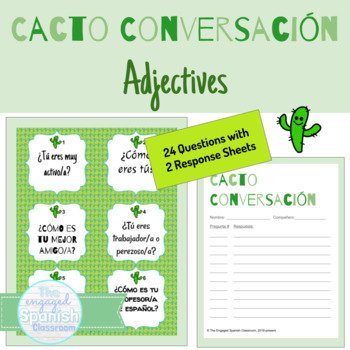 There are 24 questions, including two ¡CACTO! PREGUNTA GRATIS cards, which call for students to create their own question. Two copies of the student response sheet are also included. I hope this helps your students to feel CONFIDENT in their Spanish SPEAKING skills! I hope your students love my review activities and games! Be sure to check out my Taco Tuesday, Dice Games, Tiburones Games, Maracas Sets, and Triangle Puzzles for this unit! Follow my TPT store to see more! Check out my blog to see how I use these activities in class! Sign up for my mailing list to get free resources and inspiration delivered right to your inbox! How can you get TPT credits to use on future purchases? Go to your My Purchases page, click Provide Feedback beside a purchase, leave a quick rating and comment. Each time you provide feedback, you'll earn TPT credits for future purchases! Do you have an idea or request to make this product better? Send me an email at theengagedspanishclassroom@gmail.com. I'd love to hear from you!